Holiday Hope Chests- Your Opportunity For Holiday Giving! 12/10 final update!! WOW what an amazing, feel good opportunity the Holiday Hope Chests provided for over 100 of us who put together, wrapped and GAVE an amazing box of presents to children in need here in the Lehigh Valley. To say I’m in awe is an understatement. Each and everyone one of you, near and far, who donated is making a difference in the life of a child. How incredible is that? In the end, 70 Hope Chests were donated in the name of TheWeeklySparkle.com and our initiative to adding a little sparkle into other peoples lives. The Volunteer Center of the Lehigh Valley was so excited to receive our boxes and sent their thanks to our amazing group of givers! Total, they received over 4,000 Hope Chests!!!! Can you believe it? It’s hard to understand how 4,000 children in our community would go without getting a present this holiday season, but I’m grateful and humbled to know that because of you, and what we’re doing, that they’ll have a piece of Holiday cheer, just as we all love this time of year. Hi everyone! I just wanted to let you know I added another drop off day for the boxes right before the deadline 🙂 It will be this Thursday 12/5, from 6:30-8pm at the Panera on Airport Rd! Please try and drop your boxes off then. Affordable Pet Center will also be accepting boxes anytime between now and then at their business! It’s in Northampton on Main St by the Roxy! 11/27/13 UPDATE!! Wow! Thank you all 65+ people involved in making all of Holiday Hope Chests!!! Together, we’re going to make the holiday spirit brighter for 65 children in need! Truly amazing. Many of you have reached out to me about when you can drop off your Hope Chests and what would be convienant with your busy holiday schedules. Based on many conversations I’ve had, I think having two separate drop off points would be the most helpful! That being said, this coming Sunday and Monday I will be setting up shop at Panera on Airport Rd in Allentown (across from Target, next to Logan’s Steakhouse) where you can drop off your Hope Chests when it works best for you! The Weekly Sparkle is dedicated to the sole idea of giving back and paying it forward. Why not do something really cool this holiday that you know is sure to make the season bright for another? I know of the perfect organization right here in the Lehigh Valley that provides presents/ little care packages for children in need right here in our community. Holiday Hope Chests have been created and given to children in the Lehigh Valley over the years from caring individuals, businesses, families, groups and community partners trying to make a difference. The concept is simple: all you need is a shoe box, a little creativity and giving heart to make an amazing memory for a underprivileged child over the holidays. Help make the Holiday Hope Chest Project 2013 the most successful it’s ever been! The Volunteer Center of the Lehigh Valley provides the delivery of these items to children associated with non-profit organizations around the holidays! Here is where YOU and the fun come in. Simply message me here, or shoot me an email in my contact information page to tell me you want to get involved. You need a shoe box, (which I’d be happy to provide), and to fill it with age specific items from a list that I will provide for you once we get a final donor count on Friday Nov. 22nd. . With a larger number of donors, each of us can have our own individual child to benefit this holiday season. Example gifts range from socks, nerf balls, gloves, stickers, shampoo, combs, dolls, flash cards, water bottles, picture frames etc. 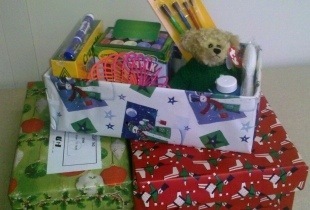 All Holiday Hope Chests have to be delivered to the Volunteer Center of the Lehigh Valley drop off site by Dec 6th. That being said, I will have two different dates where I can meet anyone at Panera in Whitehall or off of Airport Rd (by Target), with flexibility to meet and pick up boxes up until Tuesday Dec 3rd. We can do this!!!!.. And it’s going to be amazing to see all of the glowing smiles we create simply by giving a little of ourselves this holiday season. Get your kids, friends, families and co-workers involved! The more the merrier. Below is a list of suggested items for the children as well as a list of things to not gift for safety reasons. Have a large group that you know will want to form a sponsorship together? Check out the other volunteer and giving opportunities in the Lehigh Valley here! Your Time is Limited, So Don’t Waste It. Dogma. Synonyms of this would be undoubtable ‘truth’ or ‘belief.’ Dogmatism is “a set of beliefs or doctrines that are established as undoubtedly in truth.” Translation, Dogma is what society creates and tells us are ideals. What we should wear, how we’re supposed to act, who we should date, who we should marry, what kind of job we should want, what kind of car we need, what is okay, what’s considered sensitive, how much we should weigh, and lastly, my favorite, what’s expected of us as a whole. Whether your younger or older, I can imagine that at one point in our lives all of us have felt as though we were supposed to fit into a specific mold. There is a standard out there, created by whom I’m unsure, but there are guidelines presented before us that we’re expected to fill into, somewhere. I believe the point in this saying and why I want to talk about it, is that it is SO EASY to fall into these set out expectations and feeling like you need to go down a path others have set for you. Our entire lives there will be people we feel as though we need to act a certain way around, because that’s how we allow them to make us feel— do not give power to these people. Even if it’s not verbalized, we give in to these individuals by over-thinking our relationships with them or worrying about them when we shouldn’t. Again, time wasted. We shouldn’t allow people who contribute so little to our growth as human beings a second more than they deserve. You do NOT need to fall in line with a path that has been beaten for you. There is no extra time given to those who try and please other first, and themselves second. Let me repeat that, there is NO extra time given to those who try and please others first, and themselves second. We all get the same 24 hours, and at one point we need to stop dreaming of what it is we want to do, and actually begin taking the steps to get there. It is okay to like making others happy, but at the end of the day, you have to be pleased with yourself. So follow your heart. Write down what it is that you want to do- your expectations of yourself. Write them down on paper, online, in a checklist, and mostly, write it in your heart. If you can block out the negative voices that tell you you’re going against the grain, you’ve already won half of the battle. 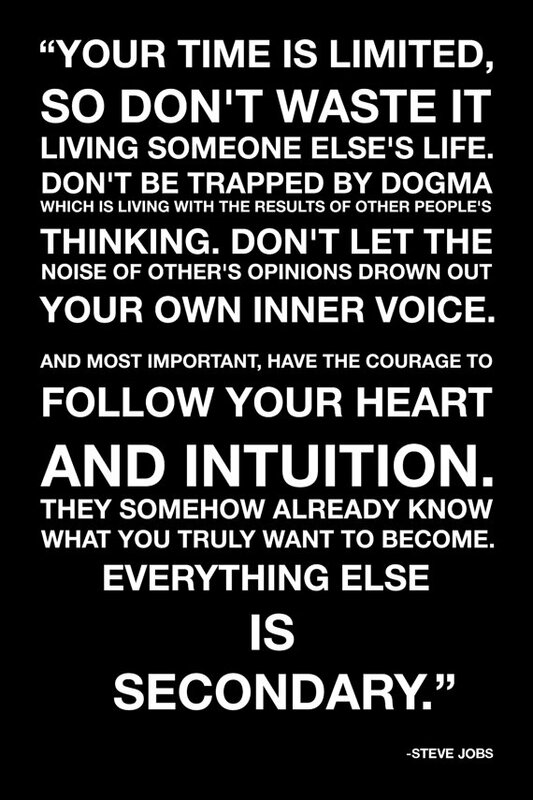 I firmly believe that I lived the first half of my life letting Dogma choose the direction I would go. I followed the crowd and wanted to be liked, which meant doing what others thought I should be doing, even if it wasn’t something I cared for or enjoyed. As I keep growing into an adult, I’m finding that who I’ve decided I wanted to become is actually well received– and liked. All along I was trying to fit in, when the person I am meant to be, needs to stand out, and this person sparkles. When you feel good about who you’re becoming and the people by your side, there is no care of Dogma or time being wasted. Life your own life, trust in your own instincts, believe in yourself and GO. YOU are first… negative, fears, others, dogma, circumstance, is all… second. The true you will Sparkle, trust me.